Various legumes and clovers, especially the red clover, are said to cause temporary infertility in female sheep when grazed during breeding season. If grazed for a prolonged period of time, red clover can supposedly cause permanent infertility in ewes. The cited reason for that infertility is an estrogen-like substance called phyto-estrogen. If you are a subscriber to one of the national sheep publications you probably have come across an article warning you of red clover, perhaps even of white clover as well as other legumes. I seem to see at least one article every year. Most studies conducted on clover were with grazing sheep on subterranean clover in Australia, starting in 1946 (Bennett et al). This was the first field trial to identify what is also referred to as “clover disease”. According to my research there have been several other studies with sheep grazing subterranean clover. However, there has been only one field trial in North America on red clover (Fox et al. 1959) and absolutely none with grazing white clover. On the other hand, there is ample anecdotal evidence of sheep farmers grazing clovers, including red clover, throughout the year and during breeding season and yet having lambing percentages. This includes me. I have grazed all kinds of legumes as well as lots of red clover during breeding season and have found no negative effect. My lambing percentage of my adult ewes averages 180 percent and has reached at times 200 percent. I also recall a field study conducted in my native east Germany that found no significant effect of red clover on sheep fertility. Unfortunately, I am unable to cite the study. In my view, this begs the question if these stark and firm warnings of red clover are indeed warranted. Let’s examine what we do know about red clover. First, red clover, like many other legumes, forms a symbiosis with a soil bacterium called Rhizobium. This bacterium is able to fixate air nitrogen, which benefits the clover itself but also leaches in part into the soil, which benefits other species like grass. In return, this bacterium gets some energy in the form of sugar from the plant. Figures vary greatly but with only 20 to 30 percent of red clover in the pasture mix, 80 to 200 lbs. of nitrogen per acre can be fixated. I have red and white clover as well as some other legumes well above the 30 percent mark. That means the need for commercial nitrogen fertilizer can be completely eliminated. Secondly, red clover is high in digestible nutrients and is well liked by sheep. High amount of nutrients, digestibility, and intake all enhance animal performance. This stand is the result of frost-seeding. Photo by Ulf Kintzel. 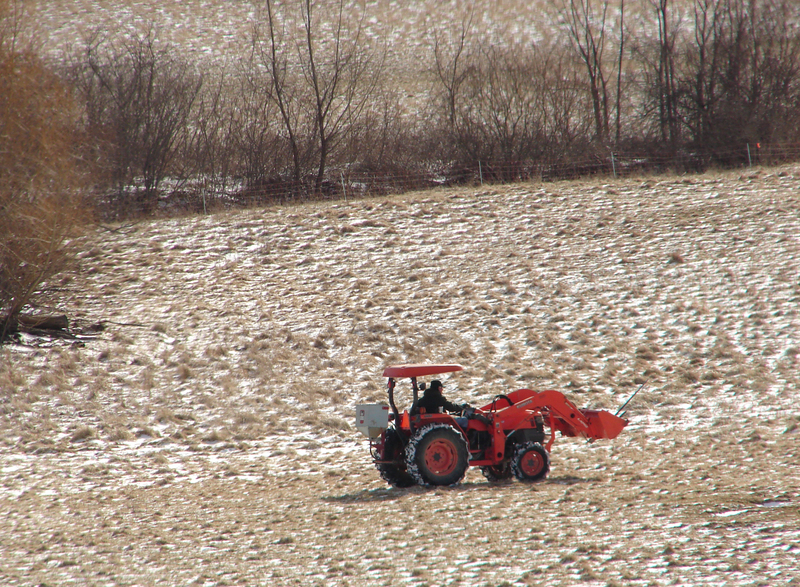 Furthermore, red clover is very easily and quite cheaply established by means of frost-seeding. In fact, I find red clover the easiest of all forage plants to be frost-seeded. Seed cost is relatively low, especially when you consider that only four or five pounds of seed per acre are needed in order to get a good stand of red clover in existing pasture. There are additional advantages to red clover like relatively good drought resistance, good ability to be stock-piled for winter grazing, and high yield due to its relatively big plant size. To make the list complete I should mention that red clover, like many legumes with the exception of birdsfoot trefoil, can cause bloat. However, that is entirely a management issue. 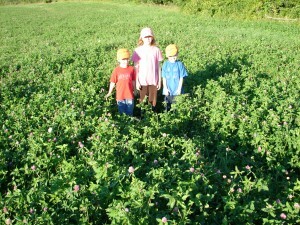 So should red clover be incorporated into sheep pasture? I believe so and I have done so for many years. Conception rates of 99 percent and lambing percentages of no less than 180 percent that I’ve achieved have long made me wonder about these studies conducted down under with mostly subterranean clover. I don’t dismiss the science. In fact, I am a firm believer in science. However, I do doubt the relevance of these studies for us in the US. Therefore, I would like to see studies conducted in the Northern Hemisphere in North America. Studies should include field trials with grazing sheep on red clover at different stages and on different varieties, and trials that examine the effect on various breeds. One study (Croker et al. 2007) suggests that the estrogen level is lower when red clover blooms – which is exactly when I graze it. There are more questions than answers and until we know more, I would find it appropriate if there were less warnings against such essential legumes in sheep pasture. Meanwhile, I will rely on my 28 years of experience in grazing sheep and will continue grazing red clover throughout the year, including during breeding season. Ulf Kintzel is a native of Germany and has lived in the US since 1995. 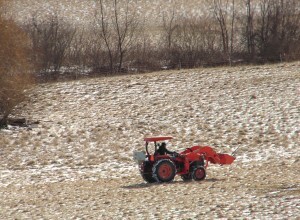 In 2006 he moved from New Jersey to Rushville in the Finger Lakes area in upstate New York. Ulf owns and operates White Clover Sheep Farm. He breeds and raises grass-fed White Dorper Sheep without any grain feeding. His website address is www.whitecloversheepfarm.com. He can be reached by e-mail at ulf@whitecloversheepfarm.com or by phone at 585-554-3313.